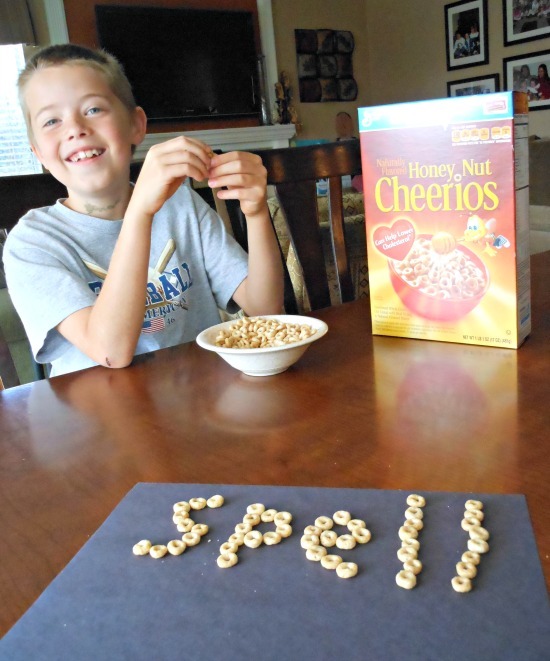 Today’s super easy spelling word activity is brought you by General Mills® via Burst Media. All opinions are mine. I’m a spelling word nut. But then you already know that right? Did you see our most recent giant crossword puzzle? Normally I plan out actives and spend a little time with prep, but today I realized that we had a list of words that needed practicing. YIKES! 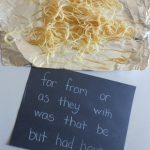 Combining breakfast and spelling seemed like the best idea! 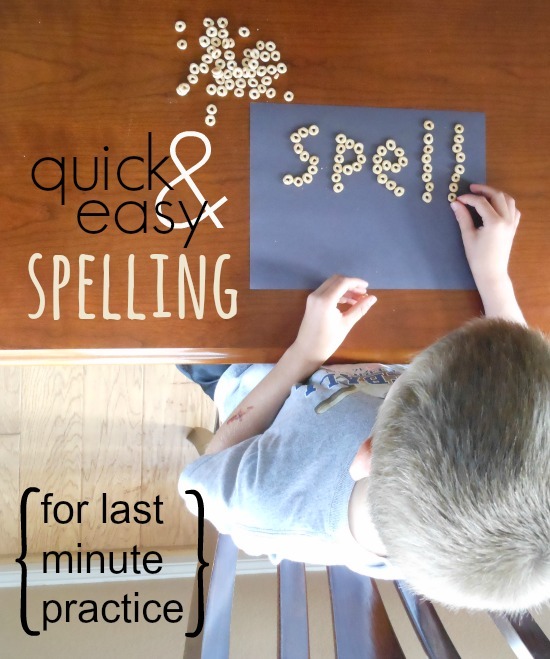 What you need: Honey Nut Cheerios® (or any General Mills® cereal), paper, a list of spelling words to practice. 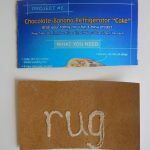 This activity was so simple, I can tell you how to do it with only 3 sentences. Set out a piece of paper. Dump out a pile of cereal. Ask you little speller to spell a word. Of course a few tips might make the process a little smoother! Once the words aren’t quite so challenging try filling in some of the letters before handing over control. 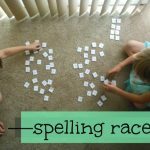 That way they don’t have to remember how to spell the entire word but they are getting more practice. If your little one gets frustrated or discouraged easily try starting with the words you know they know. I like to save a few of those to add in after going through a couple hard words. It keeps the motivation up… and reminds them that they’ve learned something. Allow for some nibbling. Honey Nut Cheerios® are way to yummy to resist. Let your little one take a bite or two while they work. Now for the good stuff! General Mills® is giving away a $50 WinCo Gift Certificate to one of you. YAY! Check out Ibotta on your mobile phone for weekly General Mills® cereal offers at WinCo. Each week until 5/25 there will be a featured cereal of the week that you can redeem for $1.50! If you buy 5 cereals, you can redeem an additional $2.50! Cereals included in this offer are Cinnamon Toast Crunch®, Cocoa Puffs®, Chocolate Toast Crunch®, Golden Grahams®, Dark Chocolate Multigrain Cheerios®, Honey Nut Cheerios®, Lucky Charms®, Fiber One Protein®. Save up to $14.50 on your favorite cereals! For more information visit Ibotta’s blog. Visit WinCo for store locations and weekly deals. We shop at WinCo (have for about 10 years) and love it! They always have what I need and at fantastic prices. My favorite is Cinnamon Toast Crunch®. I just love it. We love the Cinnamon Toast Crunch! My favorite is the Dark Chocolate Multigrain Cheerios, yum! My favorite is Cinnamon Toast Crunch but I end up buying Lucky Charms all of the time as this is my grandchildren’s favorite cereal. My kids love Honey Nut Cheerios. I like the regular kind. Cheerios were my favorite as a kid (as I think most kids love them!) and I have so many old photos of me eating cheerios out of a little purse I would always carry around. Pretty gross to think about all the germs that must have been in there, but it was delicious at the time! Now I love Cinnamon Toast Crunch for the sugar and spices! It is my go-to weekend breakfast. My favorite is coco puffs followed closely by cheerios. I love Honey Nut Cheerios but it’s aftertaste is gross lol. So I suppose I would say Golden Grahams are next in place! I love Chocolate Toast Crunch and Coco Puffs! I gave always loved golden grams! I would really love to win this GC to Winco. I travel over an hour to shop at Winco at least once a month. Their bulk food section is really a money saver. Worth the extra time. My favorite is Cinnamon Toast Crunch®.